ESSENTIALS OxyPlus is a liquid additive that can be used in hydroponic or soil systems to increase oxygen content and maintain system cleanliness. It can also be used in seed germination and as a preventative against Pythium. ESSENTIALS OxyPlus is a must have product for all serious growers. In hydroponic systems, ESSENTIALS OxyPlus can be used to raise oxygen levels. Use 5ml per 10 litres of fresh nutrient tank solution (stir thoroughly). Between fresh batches of solution, either use test strips or add an extra 2mls per 10 litres 3 times a week - this will maintain levels at approximately 30-50 ppm. 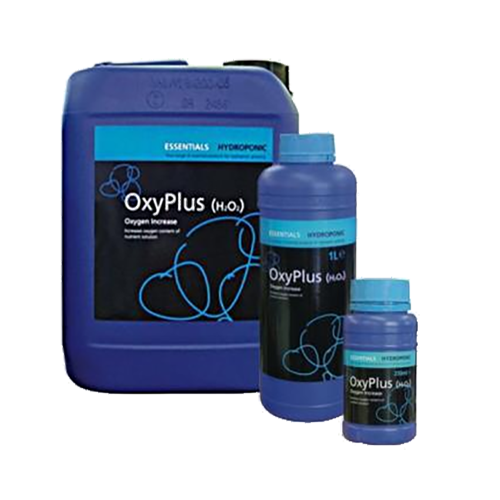 ESSENTIALS OxyPlus can be used as a sterilising agent between crops as it will clean your system killing harmful bacteria and pathogens effectively. ESSENTIALS OxyPlus will help promote rapid decomposition of organic material within the medium and tanks as well as the pipes and drippers. Remember to flush the system thoroughly with fresh plain water before installing new plants. Use 50ml per 10 litres of water. Alternatively, you can use ESSENTIALS RoomClean. Adds Oxygen To Keep Root Pathogens At Bay! Keep Oxyplus In The Fridge For Maximum Effectiveness.